NEW ROOF, SIDING, KITCHEN COUNTERTOPS & CABINETS, HOW WATER HEATER & CARPETING. GREAT FLOOR PLAN, CLOSE TO INTERSTATE & SHOPPING. HUGO OWENS & GRASSFIELD SCHOOLS. QUIET NEIGHBORHOOD. Ready to visit 2700 BEAR CREEK? Request a free property tour! Send me more information about the listing at 2700 BEAR CREEK, Chesapeake, VA 23323, MLS# 10180062. This 6 bedroom, 3 bathroom home located at 2700 BEAR CREEK, Chesapeake, VA 23323 has approximately 3,000 square feet. It is currently listed for $335,000 and has a price per sqft of $11,167. This home is currently Sold under the MLS#: 10180062. This listing is provided by RE/MAX Allegiance. 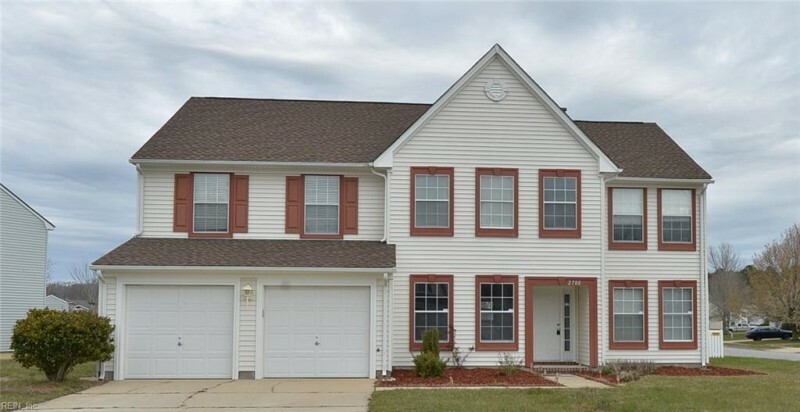 2700 BEAR CREEK Lane, Chesapeake was built in 1999. It has Garage Att 2 Car, 2 Space, Driveway Spc parking.The kitchen includes Dishwasher, Disposal, Dryer Hookup, Microwave, Range, Refrigerator, Washer Hookup. 2700 BEAR CREEK is part of the Sawyers Mill neighborhood located in 23323.